Water sport is a major attraction in Goa. From speed boats to banana boats, knee boarding, wakeboarding, parasailing, windsurfing, kayaking, water skiing, to snorkeling, scuba diving, fishing, to cruises in Goa and many more, there are plenty of options to choose from. A large section of the tourists who come to Goa, both Indians and foreigners, try water activities in Goa. Many will even try multiple activities, having lots of fun. Many of the water sports provide an adrenalin rush, they are for the adventurous, while others are more relaxing. You can charter a private yacht in Goa as well to sail through the rivers and the Arabian Sea and make your vacation truly special. You will find the water sports activity providers on the beach, while their offices are located in the streets. You can approach at either place to make an enquiry or book. But remember to check the safety before you try anything. Take all precautions and you should have a wonderful time. There are speed and banana boat rides all over Goa. 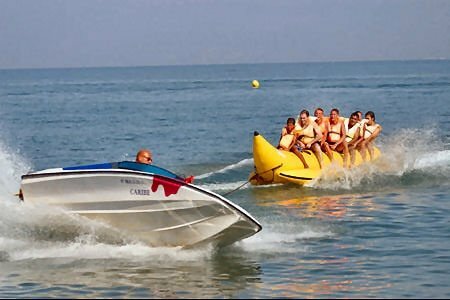 A speed boat ride is for 2 people, but banana tubes can accommodate up to 5-6 people, all your friends or family. Shaped like a banana, the boat moves against the waves. It’s a lot of fun as you ride and avoid getting flipped over. Make sure that you wear a life jacket. A banana boat ride in Goa is for all ages. It is one of the easiest water sports in Goa. Where in Goa: Calangute, Agonda, Baga, Vagator, Palolem, Miramar, Candolim, Anjuna, Colva and other beaches. Tariff: 400 Rupees per person for 20 minutes. Jet skiing is for the more adventurous. Here, you are closer to the water as you zoom through and feel the wind in your hair and the warm golden sunshine on your back. You have to definitely try jet skiing if you love speed. There are certified instructors for those who haven’t tried this fun water sports before. Where in Goa: Colva, Calangute, Mobor, Miramar, Candolim, and Rajbaga beaches. Tariff: 1,000 Rupees per person for 10 minutes, 1,500 Rupees for 15 minute rides. 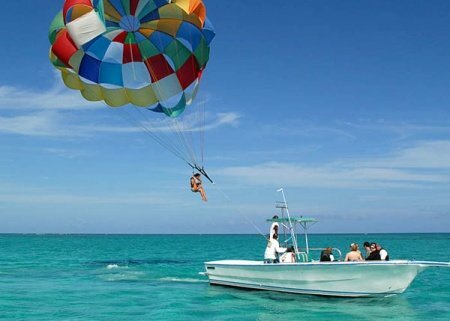 A recreational “kiting” activity, you’ll fly with a parachute with the power of the wind behind you high up in the sky. Glide through the air gently like a bird over the Arabian Sea and get a bird’s eye view of the sea, the beach, and the surrounding areas. You will get a spectacular view from up above. This is amongst the easiest and the most enjoyable water activities in Goa. Where in Goa: Majorda, Anjuna, Dona Paula, Bogmalo, Palolem, Arambol, Candolim, Vagator, Calangute, and Colva. Tariff: 1,000 Rupees for 10 minutes spent up in the air. 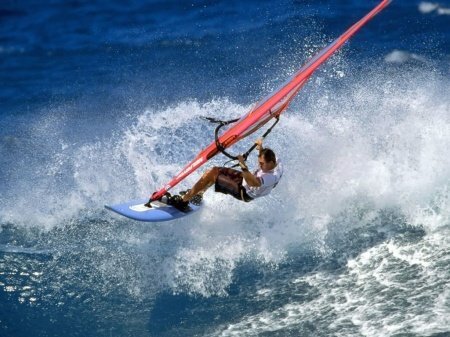 Exciting and thrilling, windsurfing brings together surfing, sailing, and the uniqueness of gymnastics on water. You can do jumps, rotations, slides, flips and loops on water, or just surf through the water gently, riding the waves. Ride on the water, and change your direction based on the wind. This is a moderate adventure sports. The morning hours are the best time for windsurfing when there is a calm breeze. Advanced windsurfers may try other hours too. Where in Goa: Bogmalo, Vagator, Palolem, Arambol, Colva, Agonda, Miramar, Baga. Tariff: 1,500 Rupees per person for 60 minutes. Achieve a speed of up to 30-40 miles an hour as you ski on the Arabian Sea. Feel the adventure and thrill as the water splashes across your face as you are rushing through the waters, gaining speed. You have to maintain balance, so it’s good to be in top health. Water skiing is one of the more difficult water sports in Goa. Alternatively, you can also try wakeboarding, which is a bit similar to water skiing. The only difference is that, in wakeboarding, you just have one board, while in water skiing, there are two boards. In wakeboarding, you have to focus less on balance. Where in Goa: Candolim, Baga, Calangute, Arossim, Uttorda, Mobor. Tariff: 700 Rupees per person for 15 minutes. A thrilling ride, where you are inside a large air filled rubber tube. A speed boat drags the rubber tube into the open sea. Also referred to as “tubing”, you have to stay within the tube as the speed boat zips through the sea, crossing the waves, and trying to throw you off. A bumper boat ride is not for the faint hearted. Adrenalin junkies who love thrills will love this water sport. Where in Goa: Candolim, Baga, Calangute. Tariff: 550 Rupees for 10-15 minutes. Not just the sea, even the rivers in Goa offers a lot of adventure. White water rafting in Goa is a lot of fun for those seeking adventure. Ride on the fast-moving clear water of the Mhadei River, crossing the many class 2 and class 3 rapids. The rumble and tumble of your raft makes it an adventure sport you will never forget. Enjoy the quiet breeze in between the rapids as you take in the spectacular jungle scenery. White water rafting is best done between June and September, during the monsoon or just after. Tariff: 3,200 Rupees per person in the Tilari River. 2,000 in the Mhadei River. It doesn’t have to be an adrenalin rush always. Gently kayak through the sea, the rivers, narrow channels, backwaters, mini bays and the mangroves seeing the water and bird life and appreciating the beauty of nature. Get close to the birds and the bats as you silently watch and take pictures. You can see kingfishers, osprey, sea eagles, and more. Spend an afternoon paddling, or you can also enjoy an early sunrise on the river. Imagine how good it would be to see the river and bird life waking up as the sun rises. Cruise past ancient temples, historical churches, and rural villages. Kayaking trips in Goa can blend culture, history, and nature. Where in Goa: Hollant, Palolem, Zuari, Sal backwaters, Spike's River. Tariff: 600 Rupees for single person kayaks and 800 Rupees for double kayaks (30 minutes), 3,500 Rupees for 4-6 hour kayaking trips. Snorkeling is fun in the waters of the Arabian Sea. There are many beaches in Goa where the water is clear and gives you a great view of the marine life. You can see batfish, barracudas, snappers, angelfish, lionfish, and more. But the best location for snorkeling is probably the Grande Island. Navy Island near Bogmalo and the Bat Island are two other good spots. The best time is between October and March. Where in Goa: Grande Island, Navy Island, Bat Island. Level up from snorkeling and try scuba diving for even more fun. Swim with the fish and even dolphins if you are lucky. There are World War II wrecks and other underwater wonders that you can explore. You can go to the Grand Island for scuba diving in Goa, Netrani Island, Pigeon Island, St. George Island, and even the Devagh Island. Grand Island is a good place for the beginners. The other destinations are for professionals and certificate holders. One good site is the Suzy’s Wreck. Don’t worry if you are not an expert yet. 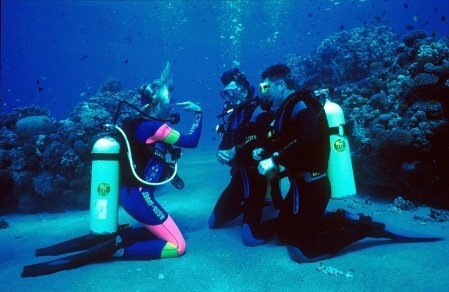 You can join a short PADI-certified course in Goa to learn scuba diving. Follow the pre-diving briefings carefully. Where in Goa: Grand Island, Netrani Island, Pigeon Island, St. George Island. Tariff: 5,000 per person for each dive. There is an opportunity for fishing in the river of Goa and also the sea. Spend 3-4 hours on a large canoe and try your hand at fishing. You can catch tuna, salmon, king mackerel, barracudas, red snapper, and more. Head back to the shore with your catch. Many restaurants will cook it for you. There is sport fishing too in Goa where you have to release your catch back into the water. Learn how to use the tools like a rod, reel, line, hooks, and how to set up a fishing tackle. You can also do spear fishing in Goa with spear guns and slings. Fishing is a relaxing water sport and a lot of fun. Many trips include complimentary snacks and drinks on board. Where in Goa: Grand Island, Mormugoa Bay, Cabo Bay, Sinquerim Bay, Sail Rock, St George Island, Sunchi Reef, Amee Shoal, Zuari River, Mandovi River. Tariff: 3,500 Rupees for a 3-4 hour trip with equipment and basic training. Recently started, underwater sea walking is for those who are not into snorkeling or scuba diving. You don’t even have to know swimming. Safety guaranteed. You simply descend a ladder and reach down to the seabed from a floating platform, wearing a helmet. 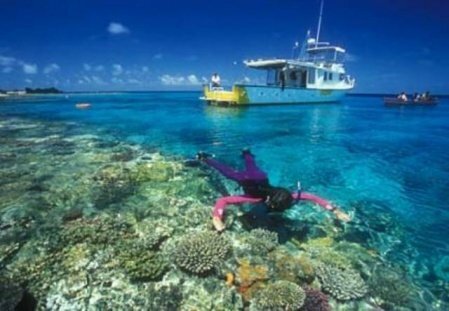 Now walk on the seabed and see a variety of marine life. An oxygen tube is attached to the helmet. The weight of the helmet will prevent you from coming up. Once you are in the water, you won’t feel the weight of the helmet. Where in Goa: Baina beach near Vasco Da Gama. Tariff: 2,000 Rupees for each person.